Class is an intensive course designed to give students entry level skills that they can use to either obtain employment in a shop as a helper/apprentice or to continue their education at a technical college. Instruction focused on classroom study incorporating national industry based training followed by practical application of that knowledge in a real shop environment. Advanced classes are heavily shop and hands on based activities using real world vehicles and methods to perform repairs that are identical to actual industry practices. Occupations in this field include everything from technicians in shops , painters and collision repair technicians to estimators, insurance adjusters, paint and tool sales, to office personnel and factory vehicle maker trainers. It is not uncommon for an experienced technician to make anywhere from $45,000 to $55,000 yearly with some salaries in the $70,000+ range. Other occupations are in the same range with the higher end positions topping $80,000. An interest in vehicles is a definite must but along with that, students who thrive in the business have a good natural mechanical aptitude along with the ability to think for themselves and problem solve on their own. Mild artistic abilities are a benefit along with the skill of being able to take things apart and put back together. Following directions and procedures is a must so that proper repair methods are followed in restoring vehicles to a safe operating condition. The work environment is often loud and dusty and people must be able to have physical ability to work in these environments. Our student organization is SkillsUSA. In our area, students compete against students from other schools with a collision repair program. State contest consists of hands on tasks that students compete on their own in several areas of knowledge. State winners advance to national contests and compete against the best from each state. In the past several years we have had tremendous success, placing students in the top three for the last several years including four 2nd place finishes in two categories. 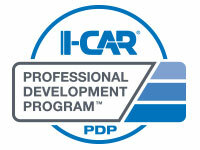 We have some national safety certifications the students can get and also have the chance to obtain I-CAR certifications at the end of the course if they choose to.